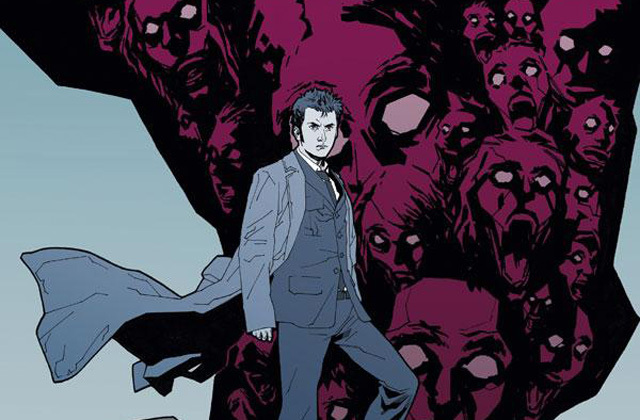 Titan Comics: Doctor Who THE TENTH DOCTOR #2.9 Review | Warped Factor - Words in the Key of Geek. Nice story, shame about the art, says Tony. When Nick Abadzis writes a Doctor Who comic-book, more often than not, he plays for stratospheric stakes. The Wishing Well Witch is no exception to that general rule – part 1 send shudders of excitement down spines with a call-back to an earlier story, while striding boldly forward in the best traditions of the Doctor turning up somewhere for a holiday and all hell breaking well and truly loose. Seriously, it’s just as well he’s got the Tardis because the likes of Trivago and Travelocity wouldn’t touch him with a record like his. This issue sees The Wishing Well Witch ‘conclude’ – insasmuch as the witch is explained and ‘defeated.’ But in the best Abadzis traditions, the story of this particular witch in this particular well is revealed to be just layer one of a big, complex, temporally twisted onion that promises excitement, adventure and really wild things to come. There’s a good deal of running about, a certain amount of companion sacrifice as Cindy, the latest recruit to the Tardis, has a run-in with the witch and suffers the ‘OCD’ which isn’t OCD, but which has infected many others in the village of Dewbury since the witch started getting uppity. All of which is standard OmniDoctor fare. It’s when the Doctor and the witch have a surrealist chinwag that things get distinctly Tenth Doctor here – things that are impossible, things that reach back to the Dark Times, things that image-check a crucial moment from the Tenth Doctor’s on-screen history which told us more about his personal history than we’d ever known. We mentioned the stratospheric stakes of an Abadzis story, right? If the storytelling punches at an elevated level, there are still issues with this comic-book. It’s a truism that classically handsome people are harder to correctly capture than those with faces that are more ‘interesting’ than handsome. It’s certainly true that Doctor Who’s closest flirtation with a heart-throb hero has been the most consistently difficult to believably deliver in over a year and a half of comic-book adventures, but Iolanda Zanfardino, on artwork duties here, unfortunately misses the mark by quite some way, so it frequently feels like a ‘Doctor Some Dude In A Coat’ comic-book. Perhaps this is a story from the period when David Tennant was off playing Hamlet. There’s plenty to like about Zanfardino’s artwork generally, her environments are impressive, there’s a fluid sense of movement, and her work on the surreal conversation between the Doctor and the witch is never less than interesting. It’s just that David Tennant doesn’t show up at pretty much any point in this issue which makes the whole thing lose some of its punch – a shame given the high stakes and high concepts Abadzis serves up in this issue. What’s equally odd this time out is the lettering. Usually, Titan gets its lettering down pat, and occasionally, it even plays a vital part in delivering the mood of a story. Here though there’s a sense of fracture, with two different fonts used in the same bubbles, apparently for emphasis but coming off as indecisive. It doesn’t help that things like the capital ‘D’ of ‘Doctor’ are missed, but overall, the lettering this time is more distracting than helpful – a surprise from the usually reliable team of Richard Starkings and Comicraft’s Jimmy Betancourt. So is issue #2.9 one to pick up then? Well, it’s one with enough ‘kapow’ factor about the story elements it delivers that you pretty much can’t avoid it if you want to understand what’s coming next. Certainly, you’ll have missed a big trick if you read on without taking executive notice of the big plot element that’s revealed here. But in itself, this issue’s like a gourmet meal where the main’s a little cold and the dessert is a healthy sorbet. You’re left with more of the sense of what it could have been, and what it should have been, than any sense of actual satisfaction at the end of it. Abadzis is firing on some heavy-duty imaginative cylinders, certainly, working some on-screen mythos into a new life in the comic-book series. 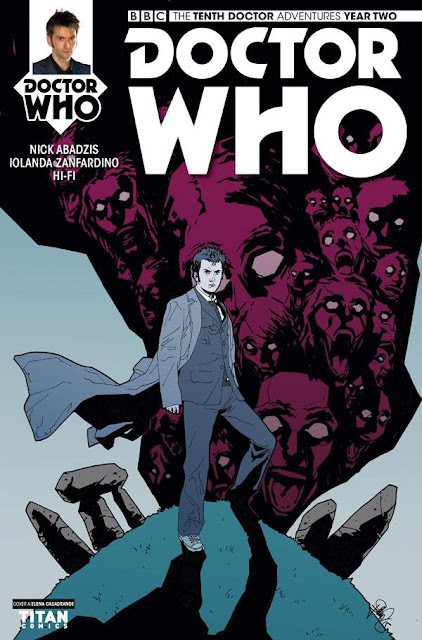 But with the artwork seeming to depict some Tenth Doctor from another dimension, and the pervading sense of oddness in the lettering, it doesn’t feel as though Abadzis is as well supported this time out as he has been in many other issues. If the audience weren’t Who-fans, to whom a gap in a collection is the equivalent of a black hole, gnawing away at your soul, we’d say this was one to read once, round your friend’s house, so you know where you are, and then move right along. But it is Who-fans, so feel free to buy it. Just don’t say we didn’t tell you so.